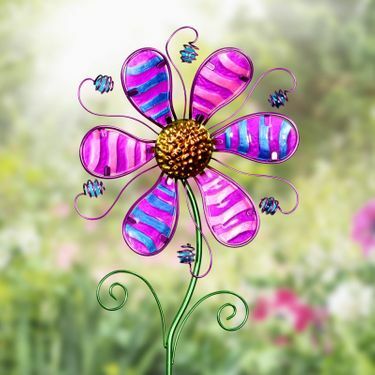 Bursting with color and garden fun, this Whimsical Purple Glass Flower Garden Stake adds instant personality to your garden. Hand painted with beautiful details, glass and metal construction make this a true piece of art in your garden. Made of glass and metal, and UV treated for durability and long lasting enjoyment. Add a whimsical pop of color to your garden! Size: 11" x 2" x 36" H.